Have you ever dabbled in a Barolo? Or had the pleasure of indulging in the Nebbiolo grape? If not, go introduce yourself. This garnet red with ruby hued liquid gold is an experience to be had by all. The ones I tried are the 2010 and 2006 Marchesi Barolo DOCG, which I describe below. Approach this wine with a touch of grace and a big smile. Oh, this wine is an amazing experience. 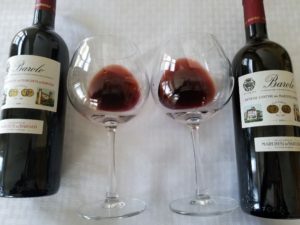 Let’s look at what Barolo and Nebbiolo are. Barolo is a region in northern Italy, Piedmont, that has the highest quality designation for wine in that country called DOCG or Denominazione di Origine Controllata e Garantita. This designation is a rigid set of laws for Nebbiolo growth for the grape of the same name and the production their red wine. This grape is known as one of Italy’s best grapes and is a persnickety, thin-skinned, noir berry which is slow to ripen. Barolo is known for its ‘terroir’ (the complete natural environment: micro-climate, geology, soil, topography, sunlight, rain, etc.) (see previous post on terroir) which consists of calcareous clay soil and a continental climate which contributes to the wine’s flavor. There is a deep, intense fog (nebbia in Italian) that sets in around harvest time in October, which is where the name Nebbiolo comes from. So, on to these Italian stallions! All wines are not created equal, which I’ve discussed that in a previous post. Even though the 2006 vintage and the 2010 vintage are made from the same grape and come from the same terroir, they are different in their flavors, aromas and colors. Granted, similar, but different. All wines are not equal. They may have the same grapes, come from the same vineyard and be made in the same way but, wow, does terroir shine her tiara when it comes to this brilliant juice. Let’s start with the 2006. With slightly more of a rusty garnet color, this has a black earth, antique wood smell with a bit of sultry blackberry, spice and licorice. Her flavor is similar with a supple tannic feel. Wise and tasteful in her years. Some tasty pairings are lamb, red meat, wild game and braised dishes. All by herself, she is reserved elegance with a mesmerizing story to share. The 2010 is also a bit mature by now with her own notes of dark cherry, roses, wood and spices with a slight smoky smell, which is the Slovenian oak (which both wines are aged on). This vintage is a smidge more garnet red with a note of orange-rust. 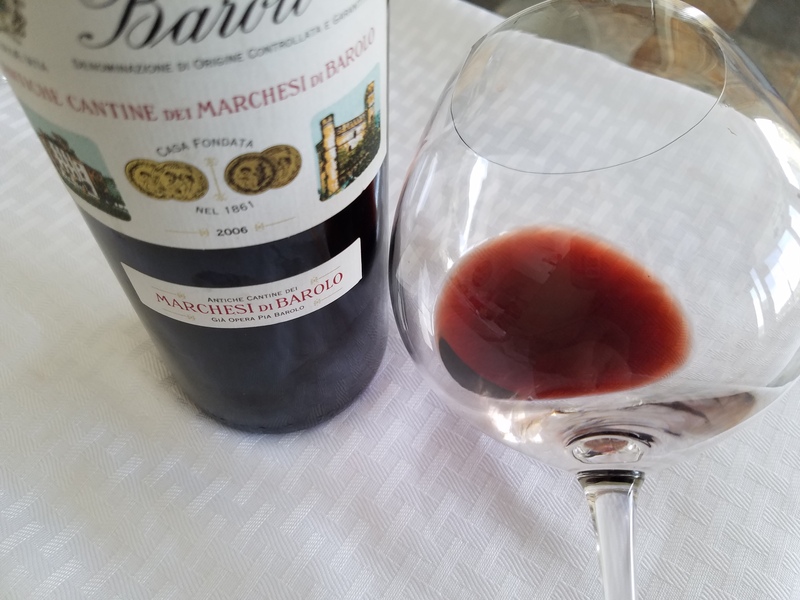 Her flavors are ripe black cherry, smoky wood, leather and black pepper ~ this has less of an aged bouquet and a more vibrant than the ’06, but with a grippy tannic feel. Rainbow trout and lamb would be divine complements. This wine alone is also smashing all by herself and can sing you a classy, vivacious tune. Same grape, same producer, same soil, comparable terroir ~ siblings, similar yet different. These two wines are different; each with her own style, personality and charisma. Both a must-try, if you get the chance! 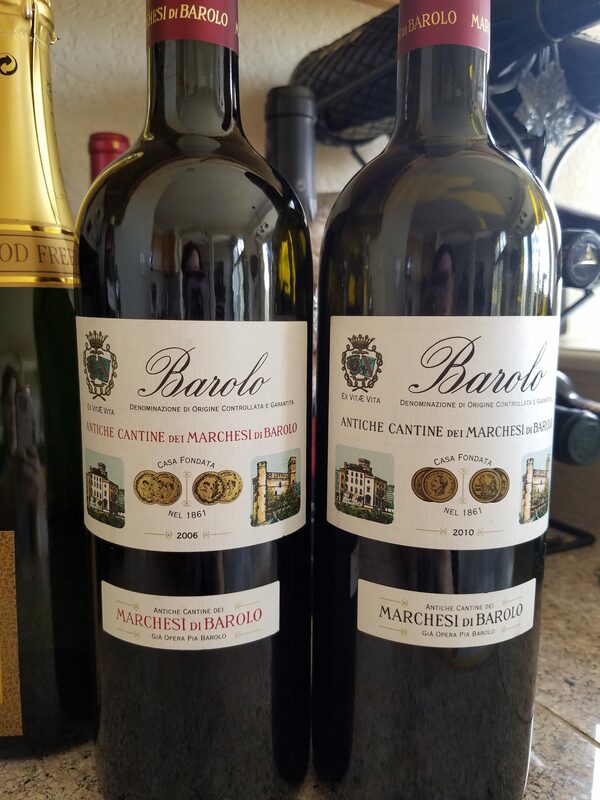 Who wins the battle of the Barolos? You do! Divertiti!